_Mickey Mouse gets a serious street make-over to become M3, Master Moves Mickey, an all-dancing, move-making, street-dancing superstar! Dressed in fresh red dance gear including chunky trainers and baseball hat, Mickey twists, turns, does handstands and really moves and grooves! For Christmas 2012, Mickey Mouse gets down to a funky beat, combining over 15 signature dance moves to create his own unique dances. 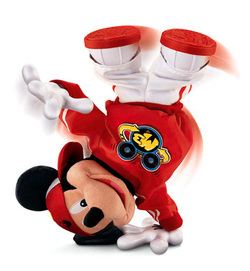 Kids can pop along with Mickey as he performs his unique moves, including “The Windmill”, “The Mouska Mix”, “The Spin Cycle”, his special handstand "The Groove Copter", and other cool Mouska-moves! He's also programmed with a selection of phrases and responses; if he falls over, he'll make a wisecrack, if he's stuck and can't get up, he'll ask for help! Just press Mickey's nose to start one of the 8 original dance tracks and trigger Mickey's amazing moves. Each dance is different as Mickey combines moves into new sequences, and encourages kids and adults alike to dance along with him. 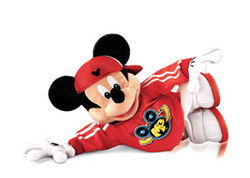 And once kids have the hang of Mickey's moves, they can share their photo with Mickey at the Fischer-Price website - cool! If kids enjoy watching dance groups on talent shows, or want to be in one when they are older, they will adore Master Moves Mickey!